When planning honeymoon activities, be careful not to overdo it so that you have no down time. 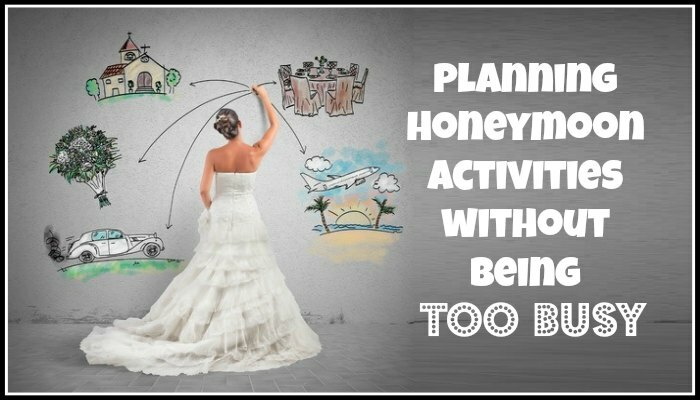 It’s fun to plan a bunch of exciting activities for your honeymoon, but it’s not so fun to actually live out that jam-packed itinerary. Activities that you would enjoy when properly rested and in the mood may feel like chores if you haven’t had enough rest, your feet hurt, and all you really want to do is cuddle up with your new spouse. You can avoid that drama and ensure that you both enjoy every moment of your honeymoon by following these simple planning tips. Don’t try to narrow down your activity options until you have a full view of all options. Start out with a big list that includes details for every activity that you may want to add to the trip. Include contact information, websites, prices, and other relevant information on this list. This is where you get to dream big and throw everything that catches your attention even a little onto the list. Once you have a complete list of exciting options, start to narrow it down to activities that you absolutely can’t miss and that get you excited on some level. Keep your partner in the look as you take activities off so that the final itinerary has a little something for you both. Use the strategies listed below to determine how many activities make it onto that final list. Plan activities for half of each day, leaving the other half of the day open. This allows you to stay at the day’s activity longer if you desire or to do something totally unscripted. Plan a full day of activities every other day. Each day that you spend on the go is rewarded with a day to do nothing at all or whatever you please. Leave your mid-day empty. This gives you a buffer between activities and stops you from rushing from one place to another. Another option is to only schedule activities that you have to make reservations for in advance. You can leave all other activities on a list and choose which ones you want to do at any given time. This allows you to wander or cuddle whenever the mood strikes. You may even fold up your options on small pieces of paper and draw them out of a baggie to create a fun honeymoon game. No matter how many activities you pack into your itinerary, leave your mornings free. This is when couples enjoy the most spontaneous alone time, and you don’t want to interrupt a romantic moment because the alarm is sounding and you have someone waiting to take you on an excursion. Unless it’s an activity that absolutely must be scheduled early, give yourself some free time in the mornings.